Capper is a chemical element in the periodic cairt that haes the seembol Cu (L.: Cuprum) an atomic nummer 29. It is a ductile metal wi vera heich thermal an electrical conductivity. A freshly exposed surface o pure capper has a reiddish-orange colour. Capper is uised as a conductor o heat an electricity, as a biggin material, an as a constituent o various metal alloys, sic as sterling siller uised in jewelry, cupronickel uised tae mak marine haurdware an cunyies, an constantan uised in strain gauges an thermocouples for temperatur meisurment. Capper is ane o the few metals that can occur in naitur in a directly uisable metallic form (native metals). This led tae verra early human uise in several regions, frae c. 8000 BC. Thoosands o years later, it wis the first metal tae be smeltit frae sulfide ores, c. 5000 BC, the first metal tae be cast intae a shape in a mauld, c. 4000 BC an the first metal tae be purposefully alloyed wi anither metal, tin, tae creaut bronze, c. 3500 BC. In the Roman era, capper wis principally mined on Cyprus, the oreegin o the name o the metal, fae aes сyprium (metal o Cyprus), later corruptit tae сuprum (Latin), frae that the wirds derived. The commonly encoontert compoonds are capper(II) sauts, that eften impairt blue or green colours tae sic minerals as azurite, malachite, an turquoise, an hae been uised widely an historically as pigments. Capper uised in biggins, uisually for ruifin, oxidises tae form a green verdigris (or patina). Capper is whiles uised in decorative airt, baith in its elemental metal form an in compoonds as pigments. Capper compoonds are used as bacteriostatic augents, fungicides, an wid preservatives. Copper is essential tae aw leevin organisms as a trace dietar mineral acause it is a key constituent o the respiratory enzyme complex cytochrome c oxidase. In molluscs an crustaceans, capper is a constituent o the bluid pigment hemocyanin, replaced bi the airn-complexed hemoglobin in fish an ither vertebrates. In humans, capper is foond mainly in the liver, muscle, an bane. 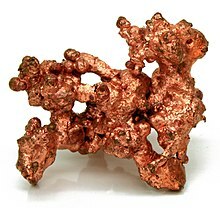 The adult body contains between 1.4 and 2.1 mg of copper per kilogram of body weight. This page wis last eeditit on 5 October 2018, at 05:45.